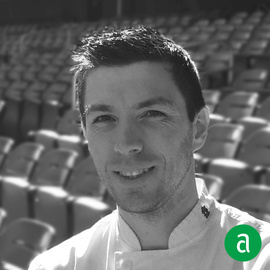 Kenneth Foland, Executive Sous Chef of Busch Stadium in St. Louis, shares his career timeline and words of advice for up-and-coming professionals. Know and understand the classics. You cannot make a proper béchamel without first knowing how to make a roux. Work smarter, not harder. I know it’s cliché to say, but time is precious so make sure you use it wisely. Mise en Place. If you understand the power of these three words and use the meaning wisely, you have a much greater chance of being successful in this industry. Have passion in what you do, it shows if you don’t. Essential literature to own: Escoffier, Flavor Bible, Charcuterie: the craft of salting, curing, and smoking, Family recipes passed down from generations. Always push for 110%. One of my mentors, Larry Johnson, always told me:"doing enough to “just get by” will not get you far." This has always stuck with me and I try to instill this into my team every day.